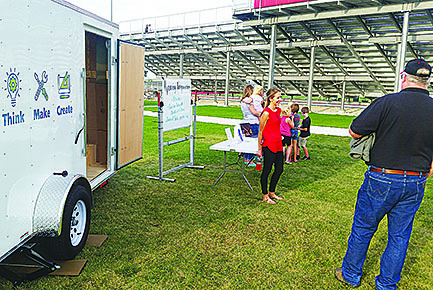 Cardinal Kids Club, the new Boone Central after school program, was displaying its new Maker Space trailer during the kickoff event last Friday, Sept. 22, before the Boone Central football game. Above, Mollie Morrow, program director, visits with Kurt Kruse about some of the upcoming programs. “Cardinal Kids Club,” the Boone Central after school program, was featured during a pre-game kickoff event at the Boone Central athletic field last Friday, Sept. 22. Parents and school district patrons had a chance to visit with the program staff, learn about projects and to see the new Maker Space trailer supplied through an Expanded Learning Opportunity (ELO) grant. Mollie Morrow, program director, and Staci Sandman, site director, were on hand to provide information. At the same time, students were close by building with LegosTM. The after school program currently serves about 33 students in kindergarten through fifth grade. There is opportunity for additional enrollment. 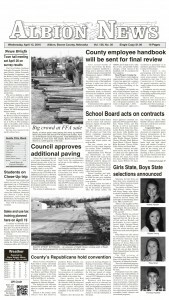 The program is available after school until 6 p.m. each day. Upcoming activities for the Cardinal Kids will include robotics, construction of a pumpkin catapult, a “cardboard challenge” and participation in National Youth Science Day. Read more in the Sept. 27 Albion News Print and E-Editions.